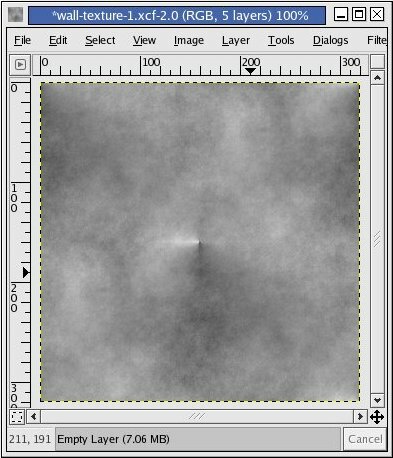 This tutorial assumes that you are able to make your way through the GIMP interface nicely. This tutorial does not aim as laying out step by step tutorial for creating photo-realistic wall texture, rather it aims at a simplified approach for creating a photo-realistic texture. The end result will depend on the amount of work put into and artistic ability of the user, so if you understand the ‘underlying approach’ instead of steps and try out your own Ideas with it, it will be a rewarding experience. In CG you will mostly have to deal with textures which are multiples of 2, like 16, 32, 64, 128, 256, 512, 1024, 2048 etc, The image size of 512 and above are heavily used as 3d game textures. In pure 3d renderings, you can use any resolution, but sticking with it, helps you to have a better and faster way of creating textures, especially ’tillable’ textures. The application of tillable textures can be in any CG since the difference between tillable and others is obvious, you can create multiple styles from a single tillable texture, which can fit seamlessly among varied versions of it. One more thing concerning the CG textures is the size at which they are painted and used. As a rule of thumb create textures double the size of what you require. 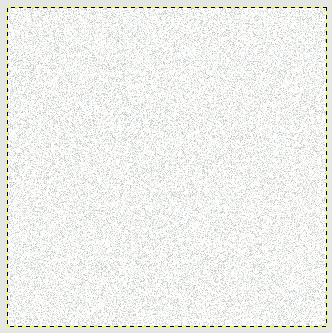 Like you need to render an image at 512×512 then your texture should be 1024×1024. This is not because of any restriction but because of the fact that you can paint more details at higher resolution than at smaller resolution, and scaling the texture by half keeps good level of detail, enhancing the overall quality of the artwork. Step1. 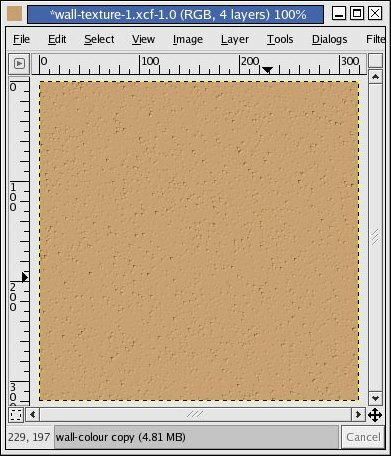 Create a new image in GIMP, you can select the size of your choice, but for the sake of simplicity we are going for 320×320 pixels. 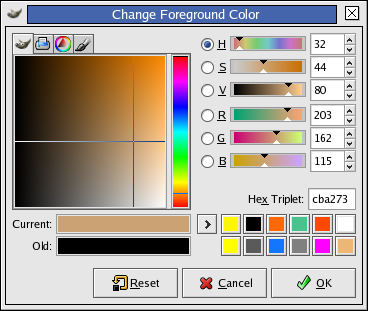 Add a new transparent layer above the background layer and fill the colour as shown in the colour selector window, rename the layer to ‘wall-colour’. This will be the base colour for the wall texture we are going to create. Image-1. The colour selection box. 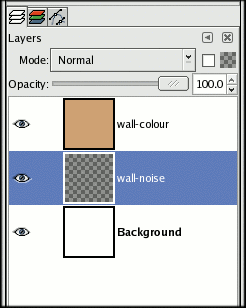 Add a new transparent layer above the ‘wall-colour’ and rename it to ‘wall-noise’. 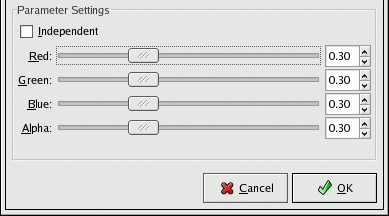 Go to Filters>>Noise>>Noisify, change the settings as shown in the Image-2. The noise added will be used to create the rough bumps on the walls. Unchecking independent will lock all the noise channel slider, so when one is moved all of them will move together. Although this step is not exactly necessary as we have to eventually ‘desaturate’ the colored noise to greyscale. The reason that the noise is desaturated is because ‘bump mapping’ takes information only from the colours between grey and white. Grey means downward bump and white mean upward bump. Middle grey is no bump. Image-2. The Noisify dialog box. Step2. Select the noise layer and go to Layer>>Colours>>Desaturate. The noise layer will get converted to greyscale, exactly what we need for the bump map for the wall texture. Step3. Now we will create the bump map for the wall texture. First select the ‘wall-colour’ layer. You would like work on a copy of it in case you mess up with settings. In the Image window select Filters>>Map>>Bump Map. The Bump Map dialog box will pop up. 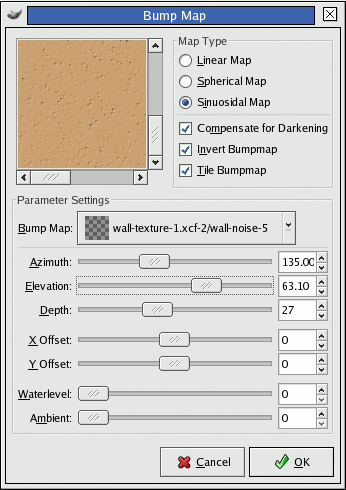 Here select the ‘wall-noise’ layer as the bump map source from the drop down selection ‘Bump Map’ (see Image5) and press ok for bump map calculation. Here do not forget to check the ‘Tile Bump-map’ as it will make the resulting bump mapped layer tillable. The Invert bump map will do as it says it will produce inverted results of actual bump mapping, try it out by toggling. 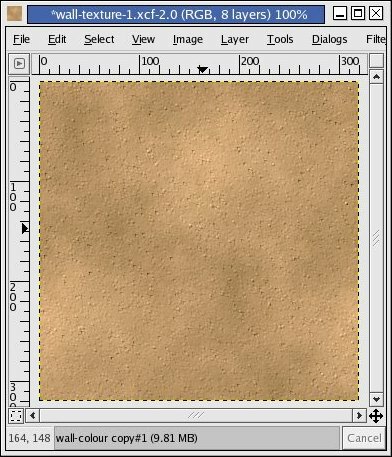 Tip: In GIMP you can check whether the image is tillable or not, by Filers>>Map>>Tile then enter the size just double of large enough for tiling. It will create a new image in the separate window. Beware only the current layer is tiled, not the whole image. To check the whole image you either have to save it in a single layer or’flatten layers’ temporarily. Image-5b. The resulting bump map. The Image-5b shows the bump mapped layer. 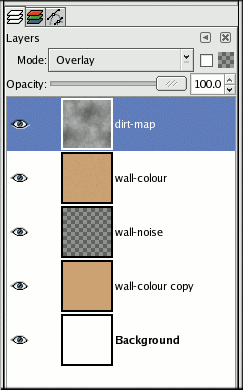 Here the colour of wall (texture) is the one made up of soil, as this texture will be used in a 3d scene relating to a ‘kuccha’ wall or a wall made up and coated of brown soil. OK, the bump map provided a good amount of detail. For me, it will work this way, but in real life the bumps on the wall will be more varied in shape size and location. So you will need to try out other types of bump map to increase realism. 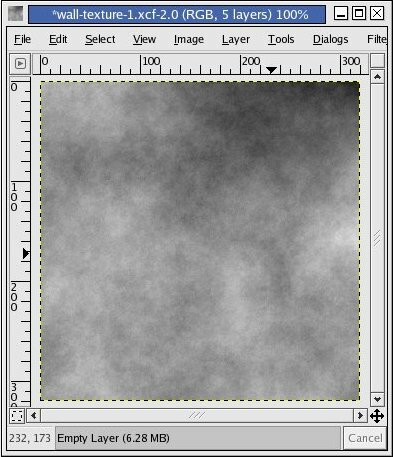 One way is to create new image of larger size and in a new transparent layer create noise pattern, desaturate it then scale it down to the current texture size, and use it for bump mapping, also you can get varied results by tweaking ‘Elevation and ‘Depth’ in the Bump Map dialog box in Image5. Further, you can manually tweak the bump layer or completely create one of your own. We will proceed here with whatever we have here. Step4. The bump mapped layer is pretty plain right now, we need to dirty it up a bit to get weathered look. There can be various ways to do that we will choose a simplistic approach. Create a new layer above all of the layers and go to Filter>> Render>> Clouds>> Plasma. You can use the settings on the Image-6 if you wish. Now we need to convert the freshly drawn plasma layer to greyscale. Again follow Layer>>Colour>>Desaturate. 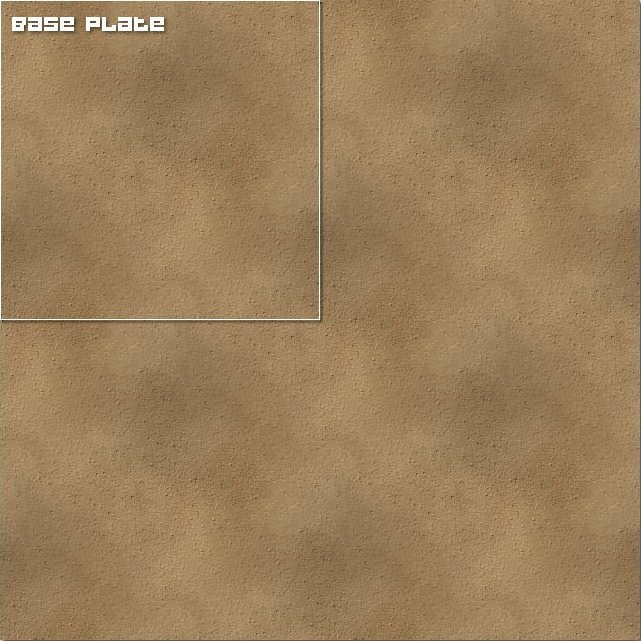 Rename the plasma layer to ‘dirt-map’. And change the mode from ‘normal’ to ‘overlay’. Image-6. 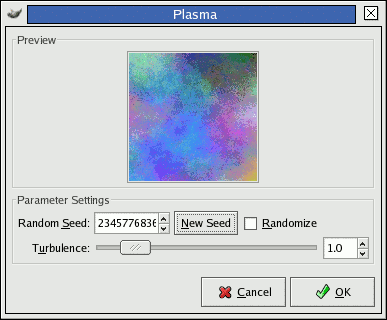 The plasma flame dialog box. Changing the mode to ‘Overlay’ brings dirt patterns in the texture. The inclusion of dirt pattern is an improvement over the earlier bump mapped version. But it still lacks more depth. If you need to add more details, you can add a transparent layer above all and set its ‘mode’ to ‘Overlay’ and start painting with grey shades, from a normal brush. The black colour in the layer will result in a white pattern in the overall image while white will produce dark colours. Another method will be to use other seed value for plasma patterns and repeat the trick given at the end of Step-3 by creating a bigger plasma, desaturate it scale it down and use as another dirt map. Image-9. Texture after simple dirt map. The following are the two different versions of the same texture, tiled as to see how they can be used. The Image-10 is the 2×2 tillable version of the finished base texture. Notice the diagonal stripes in the Image-10, these could have been avoided if we had taken the dirt map to more work. Needless to say manual editing can easily enhance or remove the diagonal stripe patterns. Image-10. The finished base texture. Image-11. The Plate-1 is the base texture and Plate-2 have hand painted cracks on the same base texture. This brings us to the end of the texture creating a tutorial. But this is not the end of learning for you remember to play a lot with different tools and experiment with the settings.